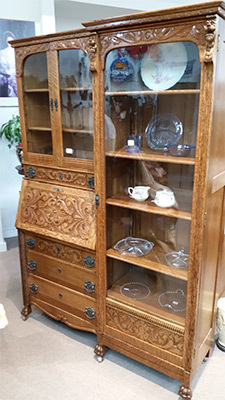 Offering the widest selection of antiques in Rapid City, SD, St. Joe Antiques Mall is a haven for all those who know that age and beauty often go hand in hand. With dozens of dealers and all types of antiques imaginable, St. Joe is sure to have whatever you’re seeking! If you want to bring charm, whimsy, originality and style to your home, life or loved one, antiques in Rapid City, SD are the way to go. With 21,000 square feet of antique retail space, St. Joe Antiques Mall isn’t just the largest antique mall in Rapid City—it’s the largest antique mall in the whole state. We have 45 different dealers sharing space here, which means that there’s bound to be something that will catch your eye and fit with your personal aesthetic. Each dealer has their own inventory and area, which means that if there is a particular dealer whose style you connect with, you’ll always be able to find them here. We are the largest antique mall in South Dakota. We have 21,000 square feet of retail space and 45 different dealers. We have been part of the Rapid City community since 1985. Our dealers have a constantly rotating inventory. We sell all types and styles of antique items.